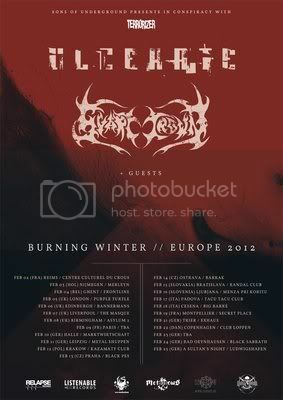 New Zealand’s unorthodox death metallers ULCERATE have announced a three-week headlining European tour in the winter of 2012, in support of their new album, The Destroyers of All. The tour will kick off on February 2nd in Reims, France and continue through February 25th in Ludwigshafen, Germany. Direct support throughout the tour will be provided by French blackened death metal masters, SVART CROWN. A complete listing of dates is listed below. Ulcerate (Paul Kelland: bass/vocals, Michael Hoggard: guitars, William Cleverdon: guitars, and Jamie Saint Merat: drums) recently signed to Relapse Records and will be entering the studio in the fall of 2012 to record their Relapse debut. Additionally, the band will be invading US soil in May 2012 to play Maryland Deathfest X plus accompanying side-shows around the fest. More details on these dates will be announced shortly.